All group classes have a ratio of four Students to one teacher with the exception of Rainbow classes which are capped at 3 students and Water sprites classes capped at 6 babies + Caregivers. We offer three varieties of "Baby and Me" classes. All of them require parent participation up to the age of three and have a maximum of 6 baby/caregiver pairs. 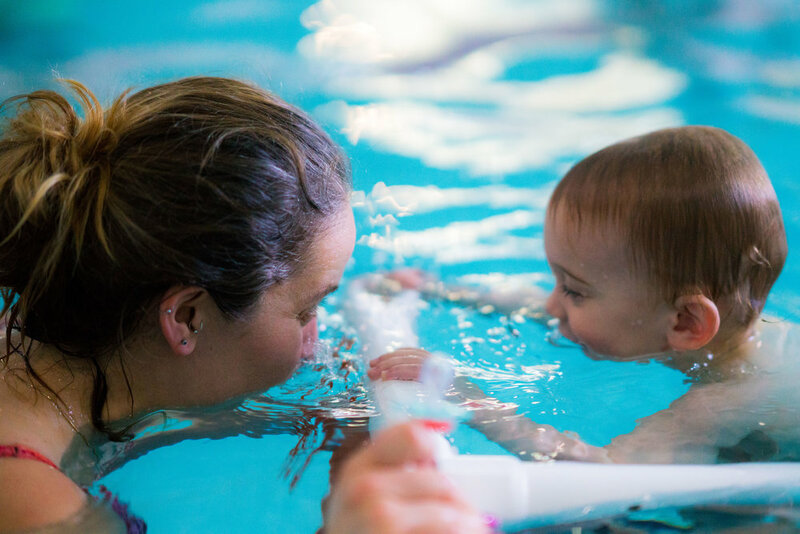 BabySprites classes are a learn to swim class for children who are 2- 14 months. They are simply a little quieter than our other offerings due to the age restriction of the children enrolled. WaterSprites classes are open to all ages 2- 36 months. Ages can be mixed, but this is a basic introduction to water. Skills to be learned include, submerging, sit jumps, moving around the pool independently with a flotation device, monkey walking, and general aquatic comfort. SuperSprites classes are limited to children who have earned an orange ribbon or higher. Due to our ongoing program, some of our little swimmers will outgrow a basic WaterSprite class. However, we still feel that a parent is going to be the most important teacher for children under the age of three. These super fish will be challenged in a developmentally appropriate manner that will allow them to work towards their yellow and even green ribbons before moving to a class without a parent. This ribbon is earned by a child who is a novice and at least 30 months old. They must become comfortable in the water, and not cry for 3 consecutive weeks. In this class we make sure that kids learn water safety through interactive water games and songs. We also help provide a foundation that will allow them to feel better prepared for the ribbons to come. Children who begin classes under the age of three will not earn this ribbon. This ribbon is earned by children graduating from a Baby and Me class. The child must be at least 30 months and be able to do the following: from mom or dad for a reasonable amount of time, follow directions from the instructor, and swim a short distance by themselves. This ribbon is earned by a child who can: Hold their breath and submerge on their own, and swim a short distance (6' to 8') with a basic dog paddle. This ribbon is earned by a child who can: Do at least five blow spouts (breaths) while dog paddling the length of the pool, swim three feet to a teacher from a sit jump, and independently return to the wall and climb out after a sit jump. This ribbon is earned by a child who can: Float on their back for ten seconds, swim one length of the pool on their tummy, swim one length of the pool on their back, swim one length of the pool rolling from back to stomach and holding each position for five seconds, return to the wall after a pencil jump (jumping in with straight arms and legs), and do a somersault underwater. No fishy feet or nose clips are allowed. This ribbon is earned by a child who can: Dive from the deck, dive and pick up rings in 6.5" of water, swim 16' underwater, and tread water for one minute. This ribbon is earned by a child who can: Swim one lap of catch-up freestyle, swim one lap of backstroke, one lap of dolphins (dolphin kick), and one lap of back scull without kicking. This ribbon is earned by a child who can: Swim two laps of freestyle, swim two laps of elementary backstroke, swim one lap underwater, swim one lap of side stroke, and perform a racing dive with a tight streamline glide. This ribbon is earned by a child who can: Swim two laps of freestyle, swim two laps of backstroke, swim two laps of legal breaststroke, swim two laps of legal butterfly, and swim one lap FAST from a racing dive. This ribbon is earned by a child who can: Do a freestyle flip turn, do a legal backstroke flip turn, do a legal breaststroke turn, do a legal butterfly turn, and body dolphin with a streamline for one lap underwater.